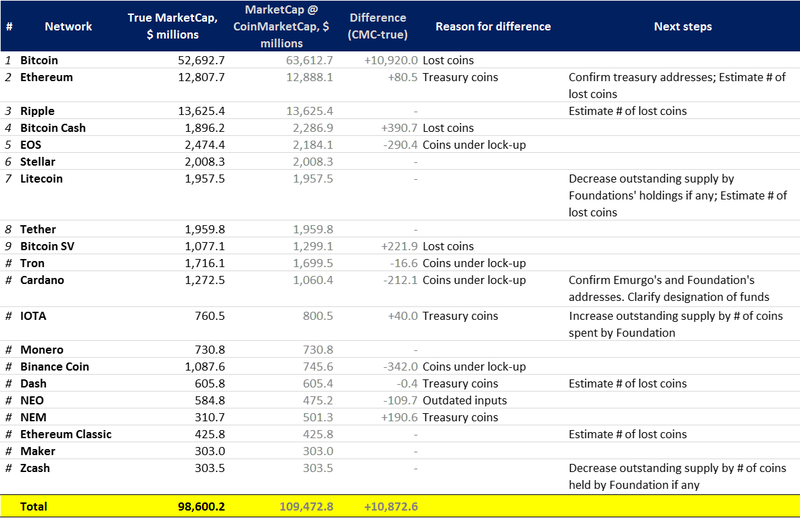 Why we must use outstanding coin supply and not circulating supply to calculate market cap? Short answers is that circulating supply is fundamentally inappropriate here. Public float approach cannot be used to measure size of companies. Analogously Circulating Supply cannot be used to measure size of crypto networks. Have you ever seen Amazon, Microsoft, Google or Apple compared by public float capitalization? No. Companies are compared by market capitalization of all shares outstanding. Index funds are major consumer of stock index data. “The sense of most index users is that float adjustment reduces the costs of running index funds and ETFs because stocks with less float — and therefore less liquidity — have lower weights in the index,” said David Blitzer, chairman of the S&P Index Committee, in an interview. In other words — index funds have to copy the composition of index that they track. If a corporation with 10% free float is included in the index fully, it will be hard for funds to buy sufficient # of shares of this corp because only 1/10th is available for purchase. If we are to create a crypto index, then circulating supply is a proper metric to weigh index constituents. In other cases we must use outstanding shares to calculate Market Cap of crypto networks.